Want to learn how to use and manage user permissions in Google Analytics? 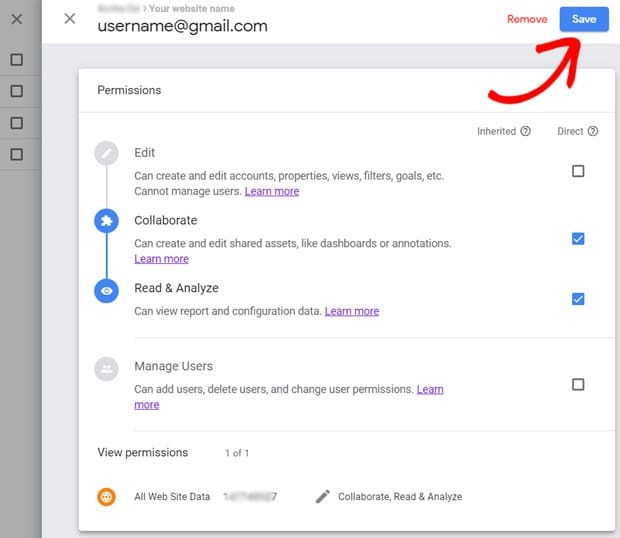 Understanding user permissions is crucial when sharing access to your Google Analytics account or data with other people as it concerns the safety, privacy, and the overall growth strategies of your business(es). 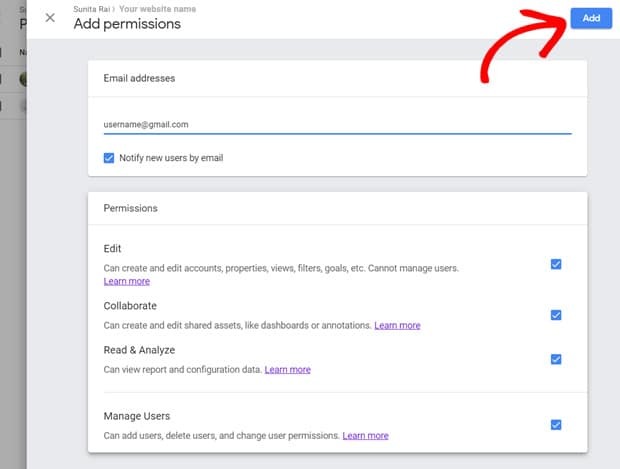 In this article, we’ll explain everything you need to know about Google Analytics user permissions and how to manage them easily. What Are User Permissions in Google Analytics? In Google Analytics, you can add other people from your team as users to allow them access to your Analytics account or data at different levels. These different levels of access to your Analytics account or data are called ‘user permissions’. User permissions refer to the types of privileges a user gets in a Google Analytics account. For example, you, as the owner of your Analytics account, can view ALL of the data, add, edit, and manage website properties, add users and manage them. However, you may not want to give that same level of access to another person. That’s what user permissions were designed for. User permissions allow you to provide a specific level of access to certain users. Using them, you can grant access to your Analytics data and share useful reports. Thus, you should carefully decide whom you want to give editing access, managing access, or view only access to. User permissions help you to share data while also ensuring your full control over your account management and data usage. Google Analytics allows you to provide 4 types of user permissions at 3 levels. Let’s first start with the permission levels. Google Analytics lets you provide permissions at 3 different levels of your Google Analytics account. The levels of user permissions are based on the hierarchical structure of Google Analytics’ organization. An account is the top-most level of organization which can include multiple properties (websites) and multiple views. Providing access at account level means allowing access to all the properties and views in your account. A property is typically a website. There can be multiple views under 1 property. For example, all website data for https://yoursite.com can be 1 view whereas only traffic to the subdomain https://blog.yoursite.com can be another view. Providing access at property level means allowing access to all the views in your property/website. A view is a subset of an Analytics account property. It allows access to only a defined view of data from a website property. For example; you may want to allow access to only the subdomain view (i.e. https://blog.yoursite.com) to a content writer on your team. That’s why you’ll see User Management option in all 3 levels of your Analytics admin options. However, this permission doesn’t include edit or collaborate permissions. It includes all permissions from Collaborate and Read and Analyze permissions but not Manage Users permissions. Collaborate on shared assets like custom reports, dashboards, segments, etc. It includes all permissions from Read and Analyze but not Manage Users and Edit permissions. Manipulate data within reports like filtering a table, adding secondary dimension, create a segment, etc. See shared assets however cannot collaborate on them. It doesn’t include any of the permissions discussed above. The users can perform actions on only the levels for which they have these permissions. For example, if a user is allowed Manage Users permission at Account level, they can add, manage, and delete users in the account, in all website properties, and views. However, a user with Manage Users permission at View level can add, manage, and delete users for only the 1 view they’ve permission for. Normally, you may not want to allow Manage Users or Edit permission at Account level to anyone except yourself and your business partner with equal share. How to Add Users and Manage Permissions in Google Analytics? Now that you know the user permissions and levels, you probably want to know how to add users and manage permissions. We’ll show you how to do that. To get started, you’ll need to sign into your Google Analytics account. Then, click the Admin option at the bottom of your Analytics panel on the left. Now, you’ll see the 3 levels of access (i.e. Account, Property, and View). And, you’ll also find the User Management option below all 3 access levels. Navigate to your desired level Account or Property or View and click the User Management option. Then, you’ll see the list of users with a brief summary of the permissions allowed to them. Click the + (Plus) icon to add new users. Select the Add New Users option. Now, you’ll see a new page where you can add new users and assign permissions. First, enter the email address you want to add. If you want to add multiple users with the same type of permissions, you can enter their email addresses separated by the comma. Select the Notify new users by email option. Select the permissions you want to allow. Then, click the Add button. That’s it! You’ve successfully added a new user(s) to your Analytics account. Now they’ll be able to view, edit, collaborate, or manage users in your Analytics account as per the permissions you provided. How to Edit and Delete Users in Google Analytics? 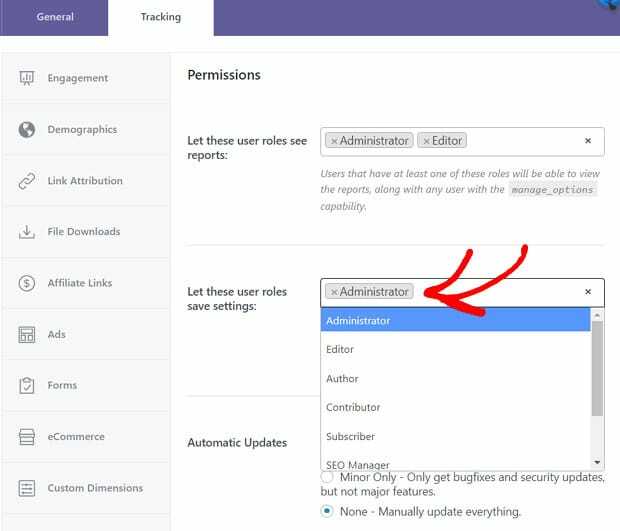 If you want to edit any user’s permissions, you can go to the list of users by navigating to Admin » User Management from Account, Property, or View. Then, navigate to the user’s name in the list you want to edit and click on it. After that, you can select and deselect user permissions as you like. Once you add or remove permissions, click the Save button. If you want to remove the user, you can click the Remove button next to the Save button. If you want to delete multiple users at once, you can go to the list of users from Admin » User Management. Then, select the users you want to delete and click the Remove button at the top of right side. 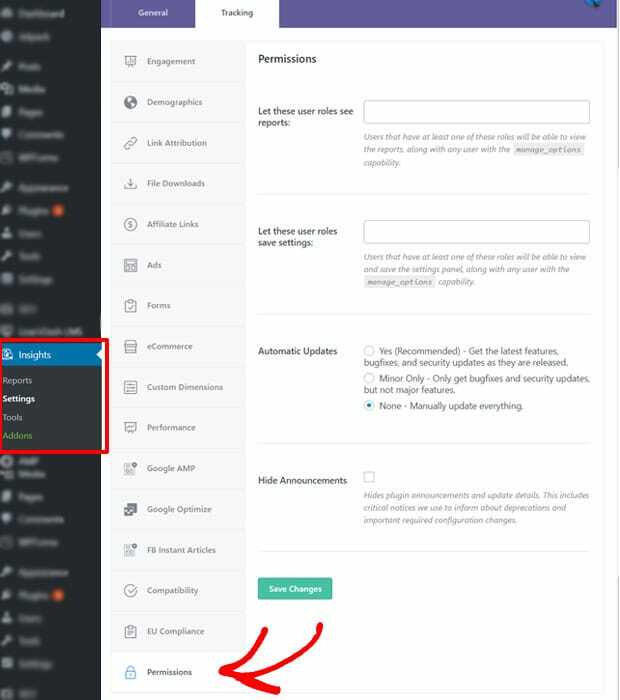 The easiest way to manage your Google Analytics user permissions in WordPress is using the Permissions option within the MonsterInsights plugin. MonsterInsights Permissions allows you to assign your WordPress users the permission to view reports and save settings in Google Analytics dashboard reports inside WordPress. And you can do that with just 2 easy clicks of your mouse. However, this method is exclusively for WordPress sites that are using MonsterInsights to use Google Analytics. So, before we show you the steps, you’ll need to make sure that you’ve connected your site with your Google Analytics account using MonsterInsights. If you need instructions, here’s our step-by-step guide on how to properly set up Google Analytics in WordPress using MonsterInsights. Once you’ve completed the setup process, you can go to Insights » Settings and click the Tracking tab. Then, scroll down to the end where you’ll find the Permissions section. Click on that. Now you can allow permissions to view your Google Analytics reports and save settings to the selected user roles. All you need to do to share access to see the reports is to select the user roles. Similarly, select the user roles whom you want to grant access to both view and save settings. Then, don’t forget to hit Save Changes. That’s it! 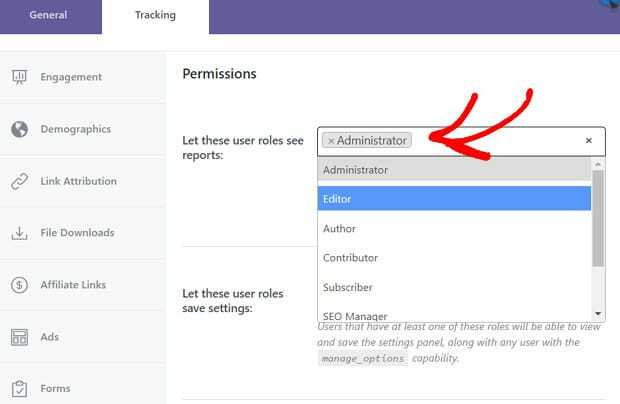 Now your selected user roles (administrators, editors, authors, or other user roles) will get access to your Google Analytics dashboard reports and settings by going to Insights menu in the WordPress dashboard. If you’re wondering why anyone would want to use MonsterInsights, here’re a few words. First, it makes Google Analytics super simple for WordPress website owners. It lets you install and use Google Analytics in WordPress effortlessly. Second, the plugin helps you track all your most important Google Analytics metrics and provides you with extremely comprehensive reports. Best of all, you can view all your reports right in your WordPress dashboard without having to navigate away to other sites. It’s the most popular, user-friendly Google Analytics WordPress plugin available on the market. We hope this article helped you learn about Google Analytics user permissions and how to manage them. You may also want to learn how to share your Google Analytics reports with others.